"You are among the few super women of now and if you never make a dollar out of aviation, I venture to say that you will never regret the time and money spent in mastering the flying machine. The accomplishment is a great reward in tself. "The skill with which you executed the test flights delignted not only your relatives, friends and acquaintances but the strangers present on the field as well. "You are the first woman flyer in this part of California to become a licensed aviatrix * * * You are the first lady aviator or aviatrix I have ever observed for a certificate and I shall follow your career with great interest should you follow aviation as an occupation. If you go in for exhibition flying I trust you develop some new specialty less dangerous and more useful than looping, or stick to conventional flying * * * or some other attractive innovation that does not involve risks that are harmful to the aviation business and dangerous to the flyer. "'Safety first' will soon be as much a watchword in the aviation world as it is now on the railroads. Millions of dollars could be earned annually by passenger-carrying aviators if the daredevil flyers would return to safe 'stunts' and stop killing themselves. Flying will always be considered dangerous until the daredevil goes out of business and as along as the public considers flying dangerous, the passenger-carrying aviator will have meager rewards for his efforts. "It occurs to me the 'ladies of the air' should line up with the safe and sane element in the aviation fraternity for the good of everyone in it and themselves in particular." 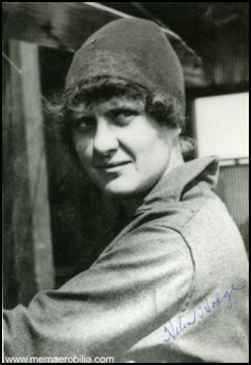 Helen Hodge was born in Omaha, Nebr., and after schooling in the city's public schools and Brownell Hall, girls' finishing seminary, she bought a course in flying at the Christofferson school at Redwood City, where Frank Bryant was her instructor on a Curtiss type. Others graduating at the school about this time were; Dr. Jack McHugo, Lyman Doty, Fred Hellen, L. Kwan, Peter Maraskey, Joe R. Forkner. After obtaining her FAI certificate she flew for the pleasure of it. In 1937 she married Frank Harris after the death of her first husband. Mr. Harris later died and Mrs. Harris now lives alone---57 years young.